This creamy lemon dill salmon recipe is a delicious low carb dinner that you can make in less than 20 minutes. It’s an easy fish dinner that only takes a few ingredients to make and has 1.1g net carbs per serving. 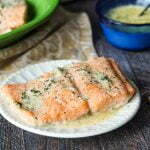 Creamy dill sauce infused with lemon tops this melt in your mouth salmon. During this time of year we are eating a lot of fish. There are Friday fish fries all around us but a fried fish sandwich is just not a low carb diet option. So today I have made for you a creamy lemon dill salmon that is very low carb, takes only 20 minutes to make and uses just a few ingredients. You really can’t beat that. This creamy dill sauce goes perfectly with salmon and has a hint of lemon to brighten it up. These were very generous portions and each piece had only 1.1g net carbs! In my long ago past, my sister and I had an herbal themed gift shop. It was wonderful having our own store and we came across so many great items to sell. One of which were these fantastic dip mixes from To Market To Market. Recently I got an email from them and thought to myself that these would be wonderful for low carb recipes. We used to sample the dips in the shop and they would fly off the shelf. Yes they were that good. So I reached out to the company and they sent me some samples to play around with and today I’m going to show you how versatile these dip mixes are in low carb cooking. This recipe will only take you about 15 – 20 minutes max. Rub a little olive oil, salt and pepper on the salmon filets and bake in a 425 degree F oven. They should be done in about 6-9 minutes depending on how thick they are. While the are baking add the cream, butter, broth and the Thrill of a Dill dip mix to a sauce pan and whisk until combined. Let that simmer while the fish bakes and it should be done when the fish is done. Add the lemon zest at the end and pour over the fish before serving. That’s it! 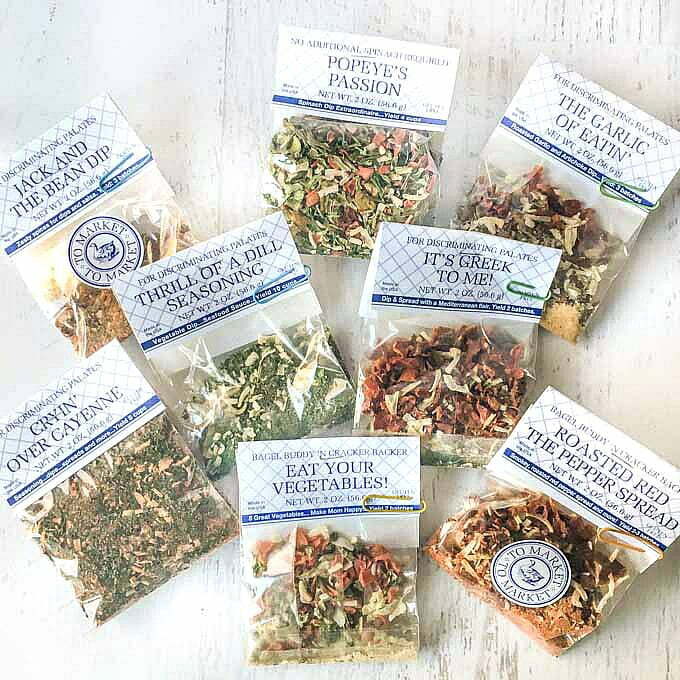 To Market Dip Mixes – Great for low carb dishes! Below you can see just a few dishes that I made with these dip mixes. As I have mentioned each packet makes a few batches of dips and spreads but I have used them to make dips, spreads, cheese balls, flavored butters, salad dressing, in stews and soup, to flavor cauliflower rice, make sauces for veggie noodles, dipping oils, and much more! Below the salmon recipe card I have listed the recipes I used in the video along with suggestions of dip mixes to try. Please let me know if you have any questions about them. To Market was kind enough to let me offer you 1 free dip with every order. 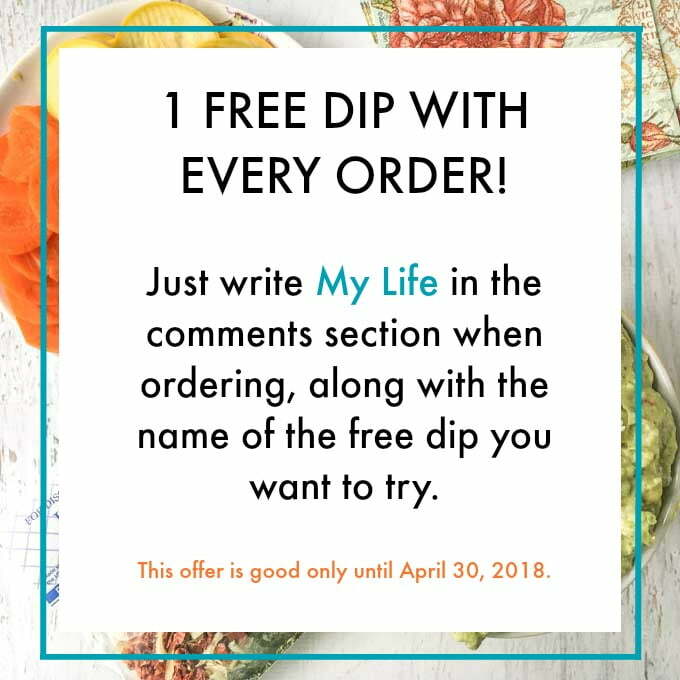 Just write My Life in the comments section, along with the name of the free dip you want. Just click on the graphic below to go to their website. This offer is good only until April 30, 2018. 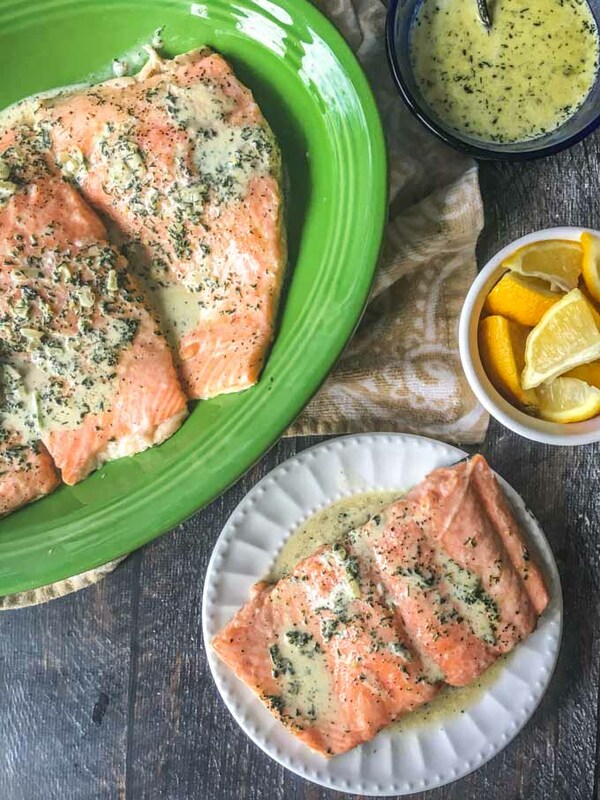 This creamy lemon dill salmon recipe is a delicious low carb dinner that you can make in less than 20 minutes. Also this easy fish dinner only takes a few ingredients to make. 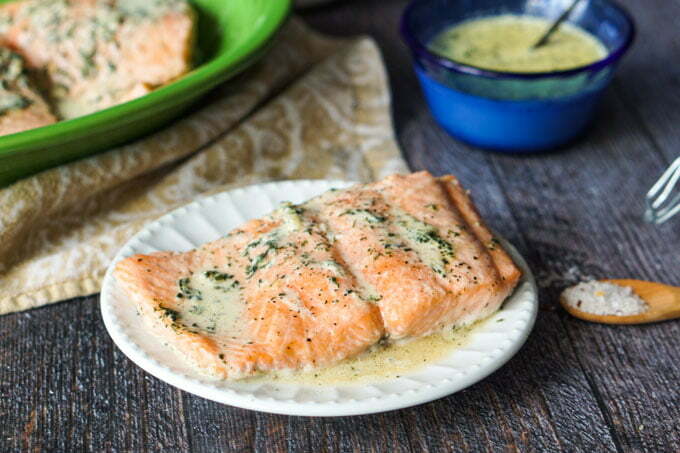 Creamy dill sauce infused with lemon tops this melt in your mouth salmon. Line a baking dish with foil and spray with cooking spray. Place salmon filets on the foil. Dab dry with a paper towel and then rub olive oil on top. Sprinkle with salt and pepper. Bake for 6- 10 minutes depending on thickness. Mine took 9 minutes and they were about 3/4 inch thick. Start at 6 minutes and then check on them until they are done. They should flake with a fork and be firm. While the fish is baking, add butter, broth, cream, dip mix and salt to a sauce pan. Whisk until well combined and let simmer for about 5 minutes. Add the zest in at the end and then pour over fish or serve on the side. *Note if you do not have Thrill of a Dill spice mix, you can use a combination of dried dill, dehydrated onion and dried parsley to equal 2 tablespoons. Easily make a low carb Mexican vegetable soup using To Market’s Jack and the Bean Dip spice mix. Brown 1/2 lb of ground beef with 2 tablespoons of the To Market spices and 1/2 teaspoon salt. When the meat is brown, add in 3 cups beef broth, 1/2 can of diced tomatoes and low carb vegetables. Cook until the veggies are done. You can make this flavorful soup in about 15 minutes. This creamy dill cucumbers dish is another low carb side dish that would be perfect in summertime. I just used 1 cup sour cream, 1 tablespoons vinegar, 1/2 teaspoon sweetener and 1 tablespoon of To Market’s Thrill of a Dill dip mix. Mix everything but the cucumbers together and then add them in. Refrigerate until ready to eat. Another easy recipe using To Market’s Thrill of a Dill mix. Brown 2 lbs of thin chicken breasts in a skillet. When browned on both sides, take out and then make a creamy dill sauce. Add 1/2 cup of chicken broth to deglaze the pan and then add1 tablespoon butter and 1/2 cup heavy cream with 2 tablespoons of To Market Thrill of a Dill. Whisk and add in the chicken. Cook for about 5 minutes or until the chicken is done. This is a fun Greek version of guacamole. Using 3 tablespoons of To Market’s It’s Greek To Me, mix with 2 avocados, 2 tablespoons lemon juice and 1/4 cup of sour cream. Top with feta for a super delicious dip you can use with veggies or top a burger with. Follow the directions on the back of Eat Your Vegetables dip mix (a mixture of cream cheese and mayo). Cut vegetables into thick cracker like pieces and spread like you would on a cracker. Jack and the Bean Dip – great to make a bean dip with but that is not low carb. You can use it with ground beef to make tacos or add to any Mexican flavored dish like the soup recipe above. It’s Greek to Me: use as a marinade for chicken or lamb, in salad dressing, in the avocado dip above or to flavor vegetables. These are just a few suggestions but To Market To Market’s website has many more to pick from and they are all good. Seriously they are all good. I was not paid to write this post, I just really wanted to share a delicious low carb ingredient that will help in your low carb recipes. I ordered 3 dips, got the Roma’s Burning FREE. Then I put 3 others on my wish list. Then I looked at the recipes on the web site and now I pretty much want them all. These seasonings seem to be an easy and inexpensive way to improve a lot of common recipes! I’m really glad I wandered into My Life for the first time. Thank you! I’m so happy you liked them as much as me! When I had a gift shop they flew off the shelves when we made dips and cheeseballs so our customers could sample them. Thanks so much for taking the time to comment! These dips all sound fantastic. I really want to try the Greek guacamole! And this salmon looks like a perfect, easy weeknight dinner that my family would love! The Greek Dip is new to me and I’ve been using it a lot. I made a yogurt cheese just yesterday and mixed some of the dip in. It’s very good! This sounds amazing! Lemon and dill are two of my favorites flavors to use with fish, but for some reason I’ve never thought to put them together. I’ll definitely have to give this a try! I’m always looking for fish recipes and this one sounds so delicious! I’ll need to sub out the heavy cream for homemade yogurt but I can’t wait to try this out! I should not be reading this post when I’m hungry! I want to try all of the dishes in your video. I will have to check out these mixes. They are really good Anne. I love the idea of using dip mixes in dishes like this. Salmon is so perfect for busy weeknights, and always a hit with my family. Gorgeous meal idea! Thanks Ashley! I love using herbs and spices to add flavor to dishes without the carbs. You had me at lemon and dill. I love those flavors on fish or chicken and this salmon is probably the best ever! I love such dishes. Yum! Must try this soon. The lemon and dill go so well with fish don’t they. I hope you like it Veena. This looks really delicious! I can’t wait to try your recipe! You had your own store? How cool! This fish looks really good and would totally make this. Yes I did….me and my sister. One of the most interesting job I ever had and so much fun with my sister. Hope you like it if you make it. These dry mixes sounds so good. I’ve never tried salmon dill combo. But now I just must. I know I’m gonna love this recipe. I’m saving it to try. The dry mixes are awesome. I just made some yogurt cheese and mixed it with the Greek seasoning. So easy! I seriously just bought some salmon and was looking for something to do with it, then stumbled on this recipe. YUM! I love the lemon dill combo. Oh great! I hope you like it Chrissy. This is the perfect combination of flavors!! I could just dig right in!! These sound delicious. What a fun and easy way to make all kinds of dishes. I love these dips Patti….there are so many things you can do with them and they all taste good. These dip mixes look amazing and so does this lemon dill salmon! Perfect weeknight meal! Thanks Emily…it was really easy and tasty. Oh this salmon looks so delicious! What a great dish for eating healthier and still wanting lots of flavor! It is definitely full of flavor and perfect for low carb and keto dieters. I remember these from the shop! They were delicious! My favorites were Popeye’s Passion and Eat your veggies! I need to order some soon! I truly liked them all. They have new ones out Debbie. Salmon is so great for summer. I love the use of these dip mixes to really amp it up! This would also make a good salmon salad! Salmon is such a great fish to work with. Dill and lemon are the perfect ingredients to bring out such a great flavour. This is a healthy dinner for any night of the week. Easy, quick and totally delicious.